Socialization is an important part of a parrot's daily routine. 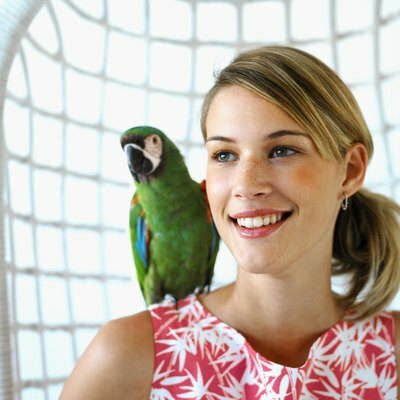 Parrots have high levels of intelligence and are more affected by stress than many other pets. When a parrot is stressed, it may become ill or resort to undesirable behaviors like screaming or plucking feathers. Seek advice from your veterinarian if you think your parrot's behavior is related to stress. Because parrots are intelligent, they are easily bored. Lack of mental stimulation can cause a parrot to become stressed. Parrots also have a keen memory, and traumatic events can cause ongoing stress, long after the event has occurred. Separation anxiety or loss of a mate can trigger stress severe enough to cause a parrot to starve itself. Loud noises or situations that trigger a flight or flight response also cause the body to be in a state of stress that may impact health and wellness. Poor health and a lack of exercise have been known to manifest as stress in pet birds. Infections, interrupted or insufficient sleep, vitamin or mineral deficiencies, illness or various metabolic and nervous system disorders are physical causes of stress. Even normal biological functions, such as molting or mating instincts, can cause stress in parrots. Physical causes of stress are best diagnosed by an avian veterinarian, as a change in diet or medication may be required to overcome the issue. Parrots are designed to live in warm climates with plenty of room for movement. When a parrot is placed in a cage, it's easy to understand how this drastic change from what nature intended can cause a parrot to feel stress. Unsanitary cages, cages that are too small to allow proper movement, improper lighting, cold temperatures, drafts and changes in daily routine are all environmental causes of stress. In the wild, parrots live in large familial flocks. Depending on the species, these flocks can include hundreds of birds. Lack of socialization in caged birds that spend a lot of time alone can cause a parrot to become stressed. Arranging your schedule to reduce the amount of time the bird spends alone or positioning another bird's cage within eyesight may help alleviate social causes of stress. Is Kentia Palm Toxic to Cats? Do Cats Feel Stress if the Owner Feels Stress?